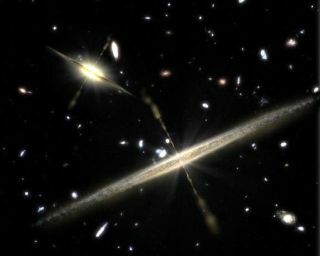 An artist's illustration showing two types of spiral galaxies that populate our universe: those with plump middles, or central bulges (upper left), and those lacking the bulge (foreground). New observations show slender, bulgeless galaxies can harbor supermassive black holes at their cores like fatter galaxies. Key clues in the mystery behind what feeds the monstrous supermassive black holes found in virtually all galaxies have now come to light, astronomers announced. It turns out that the black holes at the hearts of the skinny, bulgeless galaxies that make up roughly half the large galaxies in the universe could grow by nibbling on gas a bit at a time, researchers suggested. These new findings challenge notions of how galaxies evolve and how supermassive black holes influence this evolution. Galaxies, like people, come in different shapes and sizes. There are dwarf galaxies with up to only a few billion stars, and larger ones like the Milky Way that possess hundreds of billions of stars. Many galaxies have bulges in the middle that are tightly packed with many stars, but about half of all large galaxies are bulgeless. At the center of almost every galaxy is a supermassive black hole millions to billions of times the mass of our sun. The question of how these black holes form is an open mystery. Scientists had thought bulges were necessary in order for supermassive black holes to grow, with the black holes gaining weight as they feasted on the buffet of stars in the bulge. However, even flat, bulgeless, "pure-disk" galaxies can have supermassive black holes in their cores. To see how these supermassive black holes might grow, astronomers focused on what sources of matter they might feed on. In addition to stars in bulges, these monsters could also gorge on the disks of galaxies, the haloes of mysterious dark matter that surround galaxies, or so-called "pseudobulges," which are concentrations of starlight near the centers of galaxies in the disk that do not extend above it as do stars in a bulge. Pseudobulges may be accumulations of disk material that migrate toward galactic cores, some of it tumbling all the way in to feed the supermassive black hole's growth. It turns out that supermassive black hole size has little to no link with disk mass, dark matter haloes or pseudobulge mass. The only characteristic of galaxies that is reliably linked with supermassive black hole size is bulge size, the new study found. So how do supermassive black holes in pure-disk galaxies grow? "We now strongly suspect that there is an alternative mode of black hole growth," researcher John Kormendy, an astronomer at the University of Texas at Austin, told SPACE.com. "We could reasonably call this second mode 'nibbling' — the black hole just eats a bit of gas that happens to come too close because of random local processes like gas cloud collisions or just because gas happens to pass by the black hole." These findings could alter how scientists think galaxies evolve. Computer models suggest that galaxies can merge, with their black holes also colliding together, producing energy that can influence the growth of the resulting galaxy. Then, the merged galaxies and black holes would grow together. However, in a bulgeless galaxy with a central black hole that grows by nibbling, the black hole "never produces enough energy to influence the overall host galaxy," Kormendy said. "Hence there is no co-evolution — the black hole growth and any evolution of the galaxy happen independently of each other." These findings could shed light on the many enigmas that remain when it comes to pure-disk galaxies. "Only in the past few years have we been made aware of how flat many galaxies are," physicist James Peebles at Princeton University, who did not take part in this research, said in a phone interview. "They're a real challenge to our standard ideas of galaxy formation, because computer simulations suggest that any flat galaxies produced early on should soon get wiped out during galactic mergers." Peebles said the new study helps advance the change in thinking such galaxies demand. "These findings could at least reveal details on how they evolve," he said. "Understanding their black holes could have something to do with the puzzle." Kormendy and his colleagues detailed their findings in the Jan. 20 issue of the journal Nature.